Bacterial wetwood/slime flux is host to Maple trees, Elm trees, Oak trees, Tulip trees and Poplar trees. 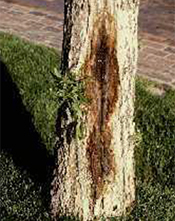 Many mature trees exhibit large light or dark vertical streaks on their trunks resulting from slimy liquid oozing out of cracks or wounds and running down the bark. This is called ‘slime flux’. Sometimes this liquid is very abundant and foul smelling. If an affected tree is cut down, the heartwood is darker in color than surrounding wood, thus the name ‘wetwood’. 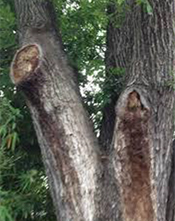 Wetwood often appears as longitudinal open wounds on the underside of branches. Wetwood bacteria can cause leaf yellowing, wilting, and branch dieback often progressing over a number of years. 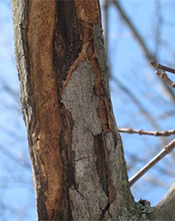 Bacteria, commonly found in soil and water, take up residence in young trees or gain entrance to older trees through wounds. The bacteria, grow within the tree using the sap as a nutrient source. As the sap is used, oxygen in the heartwood is depleted (creating anaerobic conditions), methane is produced, the pH of the sap is increased (pH 6 in healthy trees to pH 7 to 8 in wetwood), and a high pressure develops in the wood (60 psi in affected trees vs. 5-10 psi in wetwood-free trees). The resulting environment greatly inhibits the growth of fungi that can cause interior rots. The liquid kills grass and other herbaceous plants that it contacts at the base of the tree. The wood of affected trees has greatly reduced value as lumber because of the unsightly discoloration. Affected wood dries much more slowly than wood taken from wetwood-free trees. Avoid wounding the tree. Disinfect pruning tools. Protect the tree from other stresses, especially soil compaction from vehicles or pedestrians. Enhance tree health through proper watering, pruning and soil management. Many years ago, it was thought that the pressure within the tree should be relieved. Holes were drilled into the trunks of affected trees and pipes were inserted to allow the liquid and gases to escape. This is no longer recommended because affected trees generally survive well without any treatment and drilling holes in the tree creates yet another place where slime oozes out.